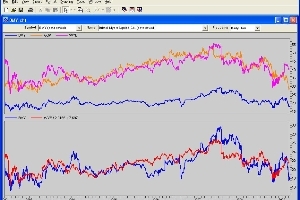 Many professional traders choose to trade pairs of stocks which usually closely follow one another. When the prices of the pair diverge a significant amount, the lower priced stock is purchased and the higher stock is shorted in hopes of a later price convergence. It is not always easy to find an acceptable relationship between stocks you would like to trade, however. 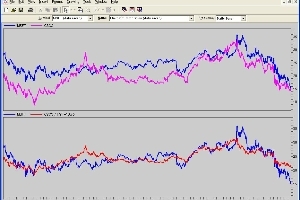 If the prices of stocks themselves do not provide a nice spread relationship, it is possible to make an algebraic modification of one of the pairs to provide a relationship that is better and easier to trade in a market neutral fashion. ChaosHunter can easily make those algebraic modifications to find acceptable relationships between stock pairs, or even between multiple stocks. These relationships can be simple linear relationships, or even more complicated non-linear ones. However, ChaosHunter finds better simple linear relationships in the vast majority of cases we have tried. Based on the formulas that explain the relationship, you can pick proper numbers of shares to keep your trades close to market neutral. 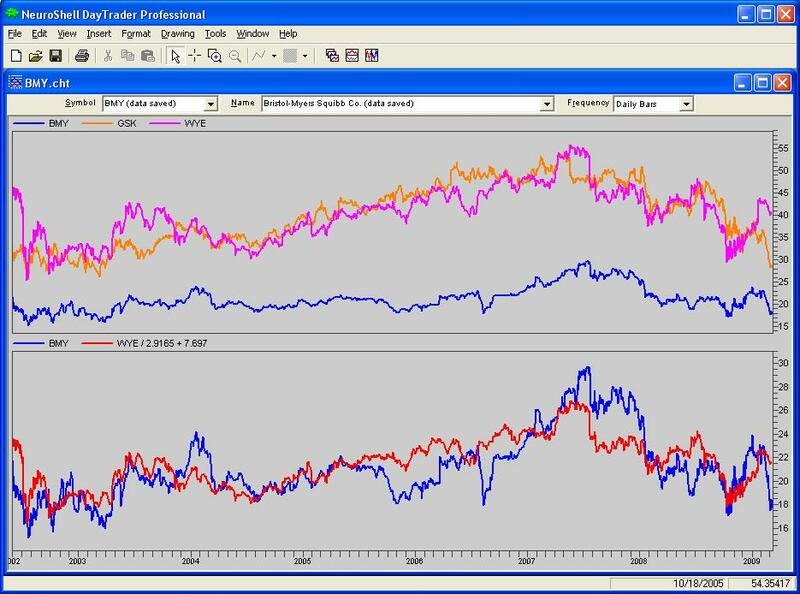 In the sequence of charts that follow, we have loaded the prices of several stocks into the NeuroShell Trader Professional for data collection, display, and subsequent trading, but many other platforms will work as well. In some cases we have simplified the arithmetic involving constant terms before displaying in NeuroShell. For example, XOM - ( SPLS - 3.42231 - 6.101346) is simplified to XOM - SPLS + 9.5. Therefore some computations below may only be approximate. Also in the profit computations that follow we are ignoring commissions, slippage, and fees. We did not verify that the stocks we used did not experience stock splits during the times we analyzed them, but you should either not use periods with splits or back adjust for them. 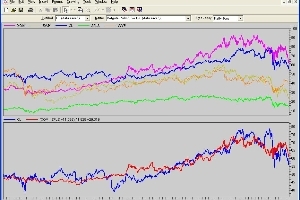 For example, on 3/8/2004, the bottom subgraph shows that MSFT at 21.65. However, based on the formula and the price of CSCO, it should be 25.45, or else the price of CSCO is too high at 22.36. Therefore, we want to buy MSFT and short CSCO. If we buy 1000 shares of MSFT at 21.65 we pay $21,650 ignoring commissions, slippage and fees. A market neutral amount of CSCO is $21,650 / 22.36 = 969 shares. 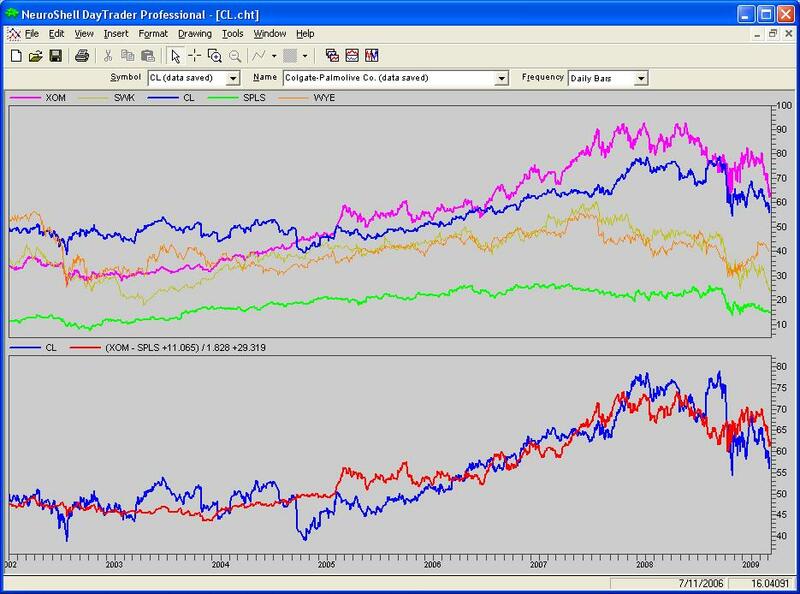 It must be emphasized that the price computation is an average based upon the time period over which the stocks are analyzed, and different formulas might be obtained if shorter and/or intraday periods are analyzed. In this example we set out to do pairs trading with pharmaceutical stocks. We loaded and examined Wyeth, Glaxo, and Bristol-Meyers. Still hoping to be able to demonstrate a case where a more complicated relationship might be necessary, we chose a number of stocks that are in different industries to find a relationship for Colgate-Palmolive. We loaded CL along with XOM, SPLS, WYE, and SWK. We still have a simple linear formula, but this time a couple of stocks produced a better relationship than just a single stock. If we had let ChaosHunter run longer it is possible it could have either dropped one of the stocks in the formula or added another, probably without significant change in the effectiveness of the formula, however. 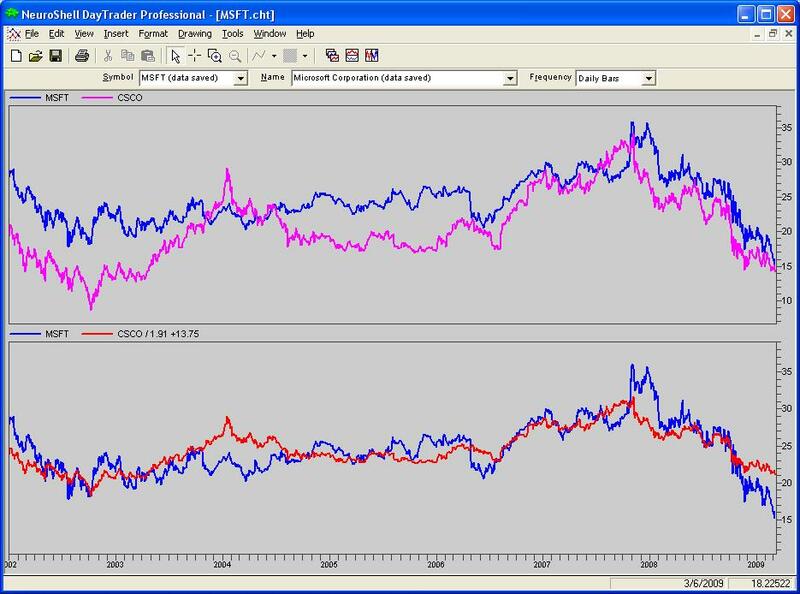 On 9/26/2005 we have a big spread between CL at 47.59 and what it should be 57.34. So we buy 1000 CL and short XOM (393 shares) but long SPLS (1169 shares). The reason we go long with SPLS is because it is negative (subtracted) in the formula. There is no reason the dollar amounts of XOM and SPLS have to be equal if you have some other scheme in mind.